Jettblack were probably the least surprising of all the bands. No real prior knowledge of them, and they sounded how I imagined they would – apart from their accents. They were good none the less. HEAT sounded as if they could have been magic. 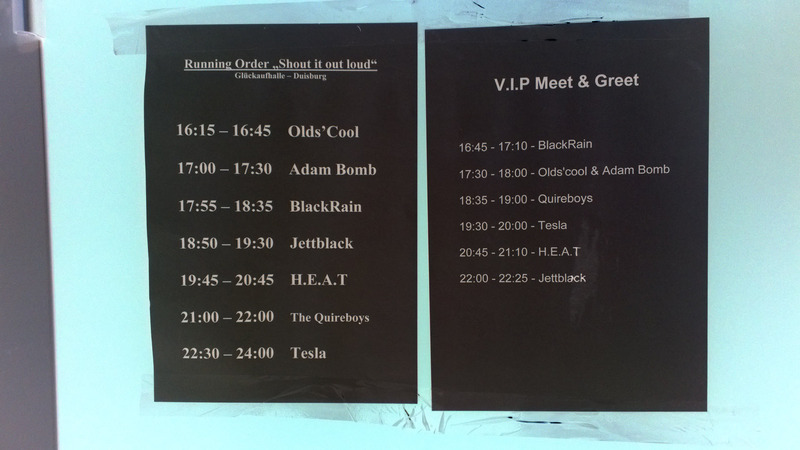 We were hangin’ in the VIP area with BlackRain at the time *. If we had gone into the crowd I bet it would have been awesome. Funnily enough they had played in Finland a few weeks prior @on the rocks. I would definitely go and see them again. Duisburg, 5th (ha ha) April 2013 will be a day that I’ll not forget for a long time. Shout It Out Loud IV really was something special. As part of a few days break in the area that took in a local game of football and many of the local beers the concert was top-notch from the time the first guitar screeched until the final bows.